Banking on the skills of our qualified team of professionals, we are instrumental in offering supreme quality range of CBN Diamond Insert. The Sandvik diamond product portfolio ranges from loose diamond granules (mesh) to micron powders to polycrystalline blanks and inserts. We are offering Diamond Inserts to our client. We are one of the most reliable companies in this domain and are into offering PCD Diamond Insert. 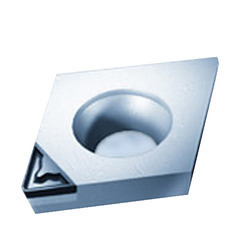 Being a quality oriented organization, we are involved in providing a supreme quality range of PCD Diamond Insert. We engaged in the manufacturing and supplying of a wide gamut of diamond inserts tools such as Diamond Inserts, Polycrystalline Diamond Inserts and Polycrystalline CBN Inserts. These are provided by us in several dimensions and sizes to meet the specific requirements of our clients. They are applicable in numerous industries. Owing to the rich industrial experience and expertise in this business, we are involved in providing Polycrystalline Diamond Insert. we are manufacturer of Precision brass Insert for all type of business, according to our customer Drawing and specification with +0.05 and -0.05 tolrence and GO & NOT Threading. We offer high quality.. all types of PCB, CBN, PCBN tips, tools & dressers can supply.